The campaign to boost renewable power supplies since the Fukushima nuclear disaster is producing some unlikely winners: vegetable farmers. Makoto Takazawa and his father Yukio earned ¥1.7 million last fiscal year selling electricity from solar panels that hang in a giant canopy above their farm in Chiba Prefecture. The cash was almost nine times more than they made from the crops growing in the soil below. Harvesting dual incomes from sunlight was a godsend to the Takazawas. Like most farmers in Japan, they depend on a combination of outside work, pension payments and government subsidies to make a living. The easing of land-use rules and mandates for utilities including Tokyo Electric Power Co. to buy clean energy at premium prices is poised to fuel the spread of panels to more farms. 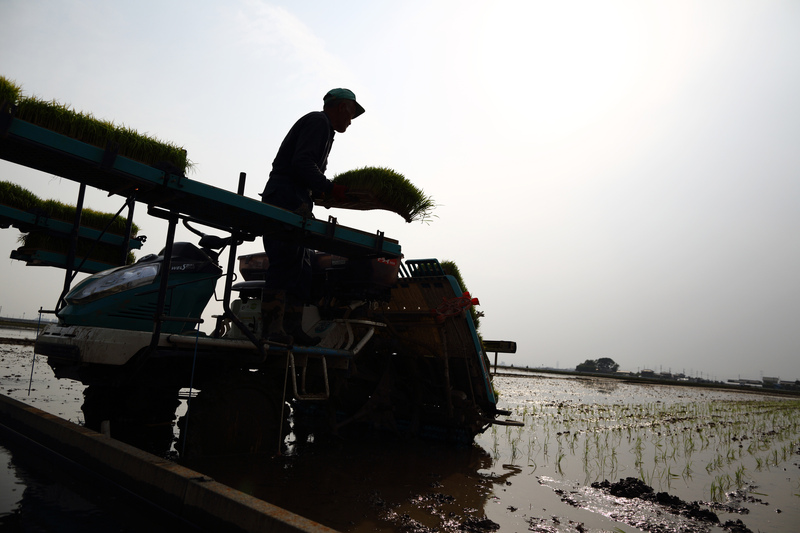 The government is dismantling a subsidy system that has supported Japan’s rice production for four decades. The country is under increasing pressure from trading partners to roll back import tariffs of 778 percent for the grain, along with levies of more than 300 percent on sugar and butter. Takazawa, 51, still works full time in machinery sales while his retired father, 78, tends the farm most days. Sixty-eight more farms across Japan have approval to follow in their footsteps and set up solar panels, according to JA Group, the country’s biggest agricultural organization. The checkerboard of panels hanging from stilts about 3 meters above the farm in Chiba reduced sunlight to the vegetables by about 30 percent without harming growth, the younger Takazawa said. The government requires solar-sharing farmers to maintain agricultural output. The system, patented by engineer Akira Nagashima, covers an area about half the size of a soccer pitch and produces enough electricity to power 10 households. 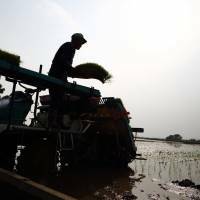 “This dual-use concept does offer the potential for another revenue source for the farming community,” said Tom O’Sullivan, the founder of Tokyo-based energy consultancy Mathyos. Wind farms are more popular on rural properties in other countries because they take up less land, he said. Japan has more than doubled solar capacity to about 13,500 megawatts since beginning a clean energy incentive program in July 2012 in the wake of the nuclear debacle, according to data from the trade ministry through February. The nuclear plants that produced about a third of the nation’s electricity before the 2011 quake and tsunami remain idled. Fossil fuels such as liquefied natural gas and coal now account for 88 percent of power production, the nation’s utilities association said last week. While renewable sources that also include wind and geothermal account for just 2.2 percent of electricity generation in Japan, approved new projects point to a further threefold rise in solar, according to government data. The nation is projected to be the world’s largest market in 2014 behind China for new solar installations, according to a report this month by Bloomberg New Energy Finance. In their agreement with Tokyo Electric Power Co., the Takazawas will sell their solar crop at ¥40 per kilowatt-hour plus tax for two decades. Power can be generated from burning coal, one of the cheapest sources of fuel, for an average of ¥9.5 per kwh, according to a 2011 report from the Cabinet. Utilities pass on the extra expense of clean energy in surcharges to consumers. O’Sullivan of Mathyos said a trend toward lowering the prices that suppliers like the Takazawas can charge may eventually reduce the attractiveness of solar sharing. Japan Finance Corp., a government-affiliated lender, sweetened the deal by arranging a ¥12 million low-interest loan for the project. Most of that was used to purchase solar panels from closely held Looop Inc., a Tokyo-based company that makes the equipment in China, according to Takazawa. Panasonic Corp., Kyocera Corp. and Sharp Corp. are among the larger listed Japanese companies making panels and components for solar projects. Yoshihiro Fujii, a professor at the Graduate School of Global Environmental Studies at Sophia University in Tokyo, said solar sharing solves land-use problems because there is little space becoming available for large projects and that leasing building rooftops is a complicated process. “A piece of idled farmland can be converted if growers find it better to use it for power generation,” Fujii said. Nagashima’s system operates on the assumption that too much sunlight can sometimes be a bad thing. The canopy is arranged to allow in enough to maximize growth, but no more. The Takazawas, who grow taro, sweet potato, pumpkin, blueberry and leafy vegetables, said yields for some of the plants increased under the shelter of the panels because the soil retained more moisture. Their property 50 km from Tokyo also includes rice paddies, which Takazawa said may be less suitable to solar farming. The family is considering turning them into orchards and buying more panels, he said. In Hokkaido, home to Japan’s biggest cattle herds, dairy farmers are erecting solar panels over properties in the town of Hamanaka and branding their product Eco Milk, according to the agriculture ministry.